Congratulations. 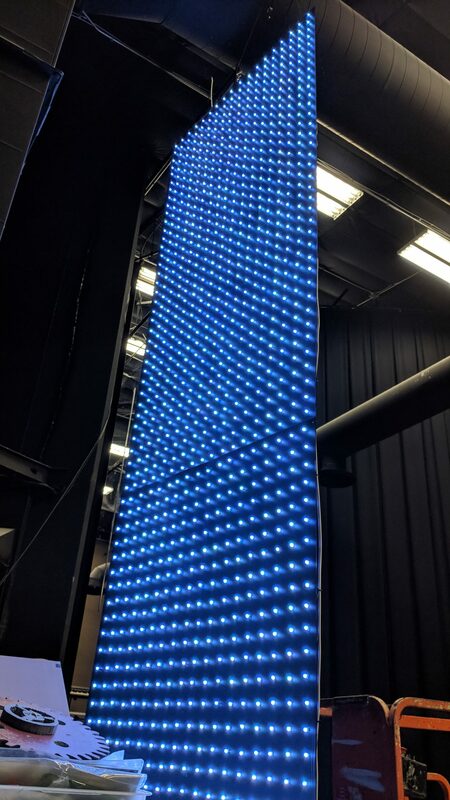 You have just completed a major job in building this LED matrix wall. Popping all those LEDs was a lot of work. Now we just need to get power to all those LEDs. What we basically are doing is whats called power injection. The small tiny wires is enough to supply enough current for say, one or two strings of 50 pixels, but once we string 13 string sets of 50 pixels together, the power drops off pretty quickly do to the wire not being big enough to carry that much power. Power injection wires shown waiting to be connected to a power bus. The power bus has not been ran yet in this photo. Power injection to the rescue. You will notice that these pixel LED strings are designed to be power injected. Every string has power “pigtails” or wires coming off the power lines of the light string. These pigtails are where we supply external power to each string. This keeps plenty of power going for each string so we get the “whitest” whites. Each pixel LED is actually made up of 3 LEDs plus a controller chip. The three LEDs are colored red, green and blue (RGB). With these 3 colors, you can make just about any color imaginable. This is basically what you TV does also. When the red and blue LEDs are on full, you get purple. When the green and red are on full, you get yellow. When red is on full and green about half on, you get orange. When all LEDs are on full, you get white. Since all of the LEDs are required to be fully on equally to get white, white requires the most power the pixel can draw. White is always the best color to use when testing your matrix. If your pixels are not white when you ask it to be white then you are either not getting enough power or your pixel(s) are bad. If a whole panel is told to show white and the panel is an orange color… that’s a lack of power issue. Okay, enough about why we need to supply good power to our matrix. Lets get started wiring. Each full panel (remember a full panel is 2 8′ by 4′ panels placed end to end for a 16′ x 4′ panel) gets 2 power supplies, one for the top panel and one for the bottom. We will cut the positive lines between the top and bottom panels to isolate the power from the power supplies to each panel. More on this later. I mounted my power supplies directly to the LEDS on the back side by just laying the power supplies on the installed pixels then wire tying the power supplies to the pixels in two places. The pixels are popped in good so they won’t pull out which makes a good mount for the power supplies. I mounted the a power supply on ht e bottom left and one on the right about a foot in from each side and about 2 feet from the bottom. The terminals on the power supplies should be facing up (or down if you prefer). Slip long wire ties under 3 columns of LED wires near the top of the power supply. Bring the ends of the wire tie up and around the body of the power supply and fasten. Do the same method for the bottom of the power supply. Your power supply will then be securely fastened to the panel. Strip off 4 feet of out insulation off of a piece of 12-2 or 14-2 electrical wire. The white wire will be the positive wire and the black your negative wire. Lets do the upper section first. Find where all of the pigtails are on the upper panel. Now there are two ways you can do the next step. 1. Strip all of the insulation off the 4 feet of both negative and positive wires. This makes it easy to solder wires to it. This is the method I did. You can put tape on the wire later to recover it if you want to. Slide the negative stripped wire below the wires loops below the LEDs with the pigtails. Slide the positive wire above the LEDs with the pigtails. This keeps the wires separated and cannot touch each other. The wires should go completely from one side of the panel to the other since you should have stripped 4 feet of wire to start with as mentioned above. 2. The second method is the strip as you go method. 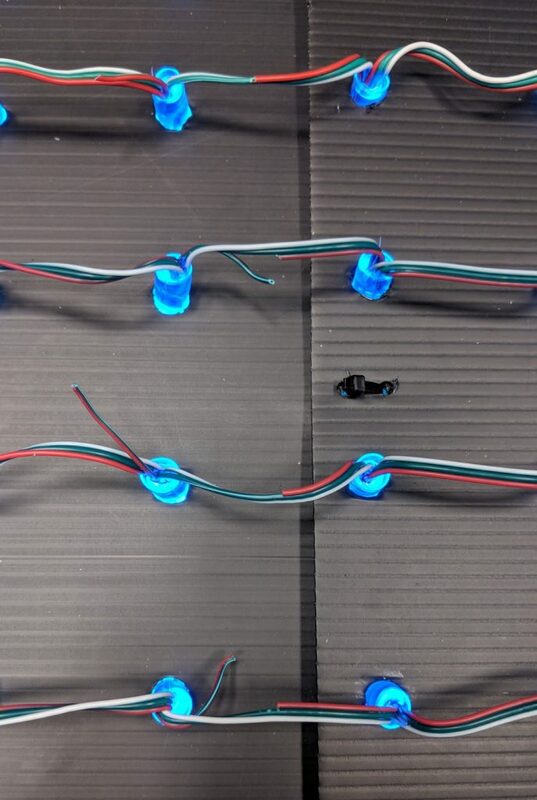 Slide the black wire under the loop of LED wires below the LEDs with the pigtails. Slide the positive wire (white) under the loop of wire above the LEDs with the pigtails. You will have to strip a section as you come to a section that needs a pigtail solder and there will be lots of them. You need to use the automatic stripper to make it easier. The first method is easier because the wire is already stripped. All you need to do is solder the pigtails. Again, the negative and positive wires should go completely across the panel from one side to the other. You can start soldering the pigtails to the wire now before routing the rest of the wire down to the power supply if you like. You will need to strip off about an inch of insulation off of each pigtail. I would strip them all first then start attaching. Attach all of the negative pigtails (blue or white depending on you pixels) to the “Negative Bus” wire you just ran across the panel. Wrap the wire around the bus wire and then solder it. Do the same with all of the positive (red) pigtails to the positive bus wire. Once you have all of the pigtails attached and soldered to the bus wires, it’s time to route the rest of the wire down to the power supply. You can run it down the left side and interlace it in and out of the L=left hand side LEDs to support the wire. Once you make it down to where the power supply is sitting, you can cut the wire, strip off the outer insulation and then strip about half and inch of insulation off of the black and white whites. Unscrew the plus and minus terminals on the power supply, there are 3 positive screws and 3 negative screws. Internally they are all attached so it doesn’t make any difference which terminals you use. Place the black wire under one of the – or negative screws. Place the white wire under the + or positive screws. Now your upper panel is wired. The pigtails for the lower panel is should be at the very bottom of the panel. Use the same procedure to strip and layout your power bus wires as we did for the upper panel except this will be at the bottom of the lower panel. Once all pigtails have been soldered, run you wire up to the right power supply and connect then wire just as we did for the upper power supply. Cut all red wires where the two panels join together. This spearates the power supplies from each other. This is important. You must sever the power connection between the upper and lower sections so the power supplies are not trying to power each other. You have a power supply supplying power to the top panel and one supplying power to the bottom panel. 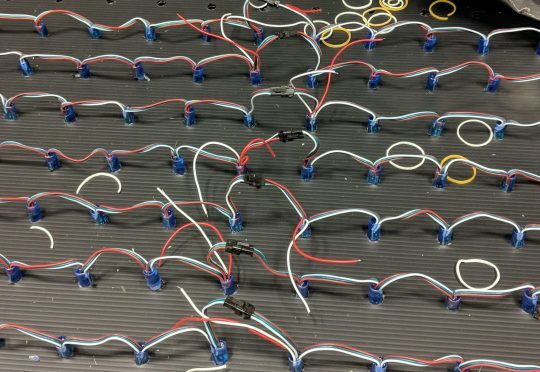 You must cut the red wire con each pixel on each column where the boards meet. Cutting the red wire will separate the two power supplies from each other. Be very careful not to cut the data or ground wire. Just snip the red wire and pull it back to make sure it is separated. The 3 wires are attached to each other so you really just need to snip the outer red wire. All of your LED power should now be connected. If you want to test your panel you first need to double check of your connections. Make sure you don’t have any positive wires soldered to the negative buses or vice versa. If you have checked your work and all is wired correctly then get yourself two heavy duty AC cords. Strip of the insulation on both of the then strip the individual wires to about half an inch. Place the wires under the screw terminals of the AC section of the power supply (120 volt section !!!! be careful here). You should have 3 wires, neutral, hot, and ground. Black is hot, white is neutral and green is ground. Connect the cord to the appropriate terminals on both power supplies. Once you have power wired up to your power supplies and all of the panel is wired for power, break out your F16V3 controller you bought either get a usb wall wart and cut the wires so you can get 5 volts to your controller or solder a long positive and negative wire from your power supply bus on your panel so you can supply 5 volts to your controller. I used a 5 volt wall wart power pack tp power my controller so I could test each panel. Note – before you power up your controller, there are jumpers that need to be set so it will run on 5 volts. Make sure you download the manual and set the jumpers correctly. The two green plugs near the bottom left of the controller are the ports. I have plugs in the first two ports with wires running to the two plugs on one full panel for testing. Once you have power going to your controller, you can wire up 2 data lines from your controller to your full panel. Remember that a full panel has 2 9 column sections. This uses two data ports on your controller. 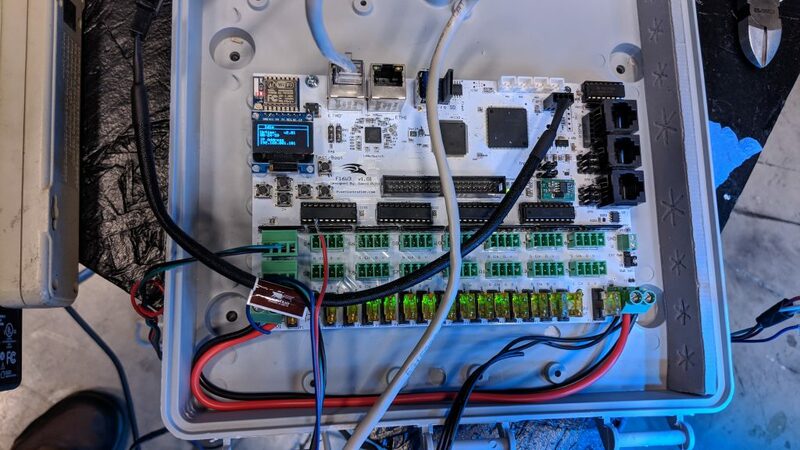 The data ports on your controller are connected to your panel through a set of two wires for each 9 column section (ground/negative and a data line). You do not want the controller supplying the power to your matrix since it cannot supply enough power. That is what the power injection was for. We are just supplying data from the controller, not any voltage lines. 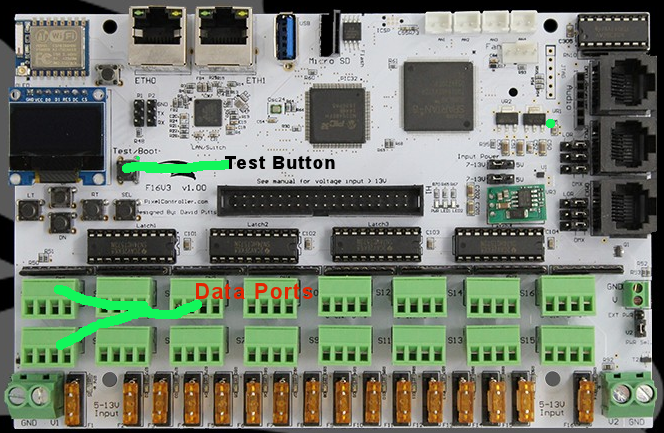 Prepare 2 data lines to test with to connect your controller to the full panel you built. Take a section of 2 longer wires and strip the two wires on both ends. The controller came with a bunch of plug in connectors. Look on the controller board as to where the wires should be placed on the connector. You only want ground and data. Not 5v. Put the two wires into the connector. You will do this for both of the test wires for the two sections. On the other end of the wires, you will need to wire a male 3 prong plug on the end that will mate up with the 2 plugs hanging off of your full panel sections. When looking at the full panel from the front, the very left connector will be port 1 and the second port 2. Plug the connectors into the controller you just put the wires into. Plug the other ends you just made into the connectors on your full panel. Plug into an AC wall receptacle, two AC cords from your 2 power supplies on the full panel. Plug in your controller wall wart to turn on the controller. The controller will boot up. Don’t worry at first if you see random lights lit up during the controller boot up. They will go out once it is booted. Test button and data ports pointed out in the photo. The controller has a test button. It is on the very right of the display. Press and hold the test button and the LED panel should spring to life cycling through colors. If it doesn’t… you have something wrong somewhere. Unplug everything. Start at the beginning and check you AC power wires. Check your 5 volt lines powering the LEDs. Check you data lines running to the controller. Verify that everything is hooked up correctly. Keep troubleshooting until you get the test to work. Below is a video of the of the controller test running. Once you get your panels running… you have 7 more duplicate panels to wire. Do them exactly as you wired your first panel. All 8 full panels are all duplicates of each other. 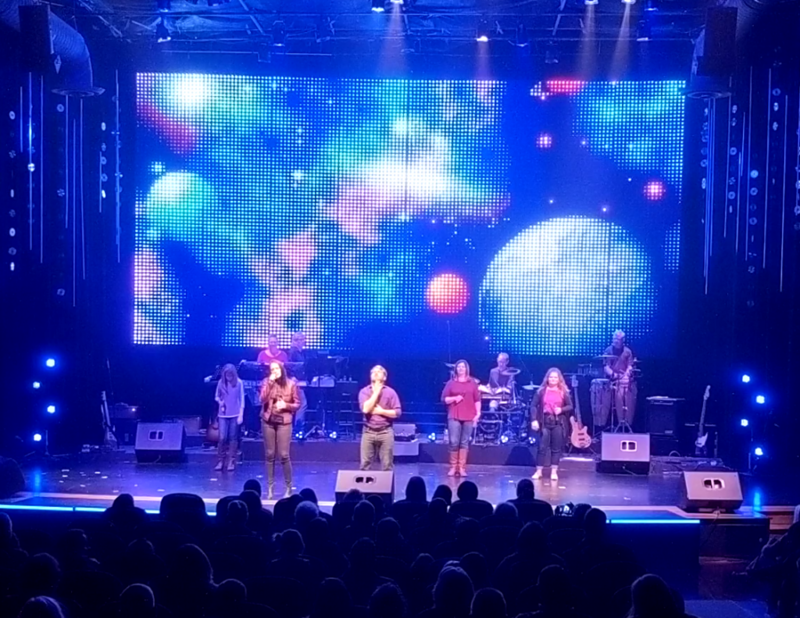 8 full panels make up the 32 feet wide LED Matrix. Just seeing one panel power up and run the test will make you jump for joy. It’s a beautiful thing when something you just created comes to life. Now we will move on to some testing and how to hang the panels. Click here for Part 5 – Hanging the Panels. Have fun!